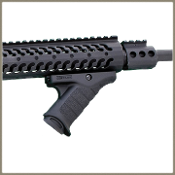 Specifically designed for shooters who train and operate with the support hand well forward on the hand guard, fore-end or rails. The further forward you grip your weapon the better able you will be able to manage the recoil. You will also be able to move, or “drive” the gun from target to target or engage a moving target more efficiently. The nature of the thumbs forward grip is to evenly distribute the most mass around the circumference of the grip. Squared up, elbows in, thumbs forward driving the gun toward the threat for increased accuracy during dynamic situations. The Express Grip allows the users forearm and hand to remain in a more natural position whether held extended and on-target or at the low ready position, allowing the forward hand and forearm to assume a “radically normal” position providing ease of movement, comfort and quicker action than any other grip. This angled grip is comfortable – in stark contrast to other angled forward grips – comfortable enough to hold in position for extended periods, whether in dynamic situations or sport hunting. Currently available in Black, Earth, Green and MultiCam.